Your buddy posted a picture of you on Facebook that you don t want any person to see. Also worse, they identified you. So now the picture is around for your friends to see. The good news is you can remove the tag from the image. > Visit your individual Facebook page, then pick the Activity Log. > Find the message or photo in the log you want to get rid of the tag from, then choose the article or photo link. > Select the 3 dots, after that pick Eliminate Tag. Option 2 Eliminate Tag from Photo. Full Desktop Computer Version Website. - From the image the page gets on use the Options link to pick Eliminate Tag. 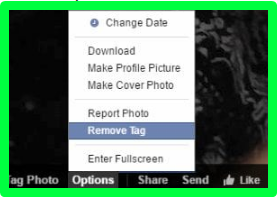 - > From the photo web page, choose the More Options link, after that pick Remove Tag. - > Select the Get rid of Tag switch. * Browse through your personal Facebook page, then choose the Activity Log. * Locate the blog post you desire to remove the tag from, then pick the arrow alongside it. * Select the reason. I normally just choose I m in this image and I don t like it.